At the weekend, a debate on the minimum wage erupted in the comments section of Ambassador-at-large Tommy Koh's Facebook page as netizens - including former labour chief Lim Boon Heng - weighed in on how Singapore should lift the incomes of its low-wage workers. This happened after a forum organised by the Institute of Policy Studies last Friday, at which Manpower Minister Josephine Teo defended the Government's position for not setting a minimum wage in Singapore. Both sides stand firmly by their arguments on the benefits and shortcomings of adopting a minimum wage. The emotive topic has also divided opinion. The Straits Times takes a deeper look at what proponents on both sides say. WHY THE CALL FOR A MINIMUM WAGE? The calls for Singapore to implement a minimum wage have resounded for many years, with those in favour of this approach arguing that it would ensure every worker earns enough to live in dignity and material sufficiency. To bolster their argument, they point out that many advanced economies such as Japan, South Korea, Taiwan and Hong Kong have implemented a universal minimum wage. And these economies have done so without compromising their employment rates, foreign investment levels or competitiveness, they say. In a commentary he wrote for The Straits Times in 2010, Professor Tommy Koh said: "(Singaporeans) also believe that hard-working Singaporeans, no matter how humble his or her job, should earn incomes that would enable them and their families to live in dignity and material sufficiency. This is, unfortunately, not universally the case in Singapore." The market does not work for low-skilled and semi-skilled workers because they do not have equal bargaining power and are competing against an endless supply of cheap labour in the region, he said. First, every working Singaporean should earn a living wage. Second, many low-wage workers here are not paid a living wage. Third, when the market fails, the state must intervene in order to ensure a just outcome. Fourth, the low salaries paid to Singapore's low-wage workers are not due to their low productivity, but because Singapore has brought in about a million lowly paid foreign workers to compete with local workers. Fifth, the Progressive Wage Model - a system introduced by the Government to lift wages for workers in certain sectors - has not raised the wages to a level which enable Singapore's low-wage workers to live in dignity. HOW HAS A MINIMUM WAGE HELPED WORKERS ELSEWHERE? According to the International Labour Organisation, more than 170 countries in the world have a minimum wage, or 92 per cent of its 186 member states. The first country to implement the minimum wage was New Zealand in 1894, with others following in the decades since. The United States implemented the minimum wage in 1938, while Germany joined the club fairly recently, in 2015. Economists are still in disagreement as to whether a minimum wage is an effective way to tackle inequality. Studies on the impact of minimum wages have also given a mixed picture. For example, a recent study by the University of California, Los Angeles focusing on how minimum wage hikes in California affected the restaurant industry showed that when the minimum wage was increased from US$6.75 per hour in 2006 to US$8 in 2008, restaurant workers earned 10 per cent more, but employment in the industry fell by about 12 per cent. When the minimum wage was further bumped up to US$10.50 (S$14.50) last year, restaurant workers saw their incomes rise by another 20 per cent, but employment in the sector dropped by another 10 per cent. However, a paper by a University of California, Berkeley team that looked at the impact of minimum wage hikes in several US cities found that while wages have risen, changes to employment have been minimal. Another paper by the University of Washington, New York University and Amazon that garnered significant attention earlier this year claimed that the rising Seattle minimum wage had decreased take-home pay for workers by 6 per cent, as employers cut their work hours. However, the same researchers put out a new paper this month reversing some of those claims. Their latest findings show that the rising minimum wage has helped increase earnings for workers who had the most hours and those whose hours were cut only a little. They added that workers with fewer hours saw no financial harm from the rising minimum wage, as they worked fewer hours but earned the same income. And so the debate rages on, even in countries that already have a minimum wage. In South Korea, a 16 per cent minimum wage hike this year, with plans for a further increase by 2020, has won praise from workers and labour unions, but drawn backlash from small business owners, who say the increased labour cost will lead them to cut jobs. The Bank of Korea estimates that the higher minimum wage will reduce the number of new jobs by up to 20,000 this year. However, the central bank added that the higher wage floor will also support private consumption and raise economic growth by 0.05 percentage point. Going a step further, Finland is one country that has experimented with a universal basic income (UBI) - in other words, free cash for the unemployed. Since January last year, a random sample of 2,000 unemployed people aged 25 to 58 have been given €560 (S$880) monthly, with no strings attached, under a two-year pilot programme. The proponents of a UBI argue it will be necessary as we head into a future where technology could decimate jobs across the world. However, Finland has decided not to extend the pilot, and plans to try other welfare schemes. WHY DOES THE SINGAPORE GOVERNMENT SAY ITS WAY IS BETTER? The Singapore Government has resisted calls for a universal minimum wage for various reasons. Manpower Minister Josephine Teo argued last Friday that it could lead to lower levels of employment, as not all employers would want to employ workers at that rate. She added that a minimum wage could also lead to some workers choosing to work illegally below the minimum wage just to secure a job, making them even more vulnerable. Former labour chief Lim Boon Heng said in a comment on Prof Koh's Facebook post last Saturday that it would make Singapore less competitive and less attractive to multinational companies. Instead, over the years, the Government has implemented alternative programmes to help raise low-wage workers' incomes. One is the Workfare Income Supplement, which tops up the incomes of those aged at least 35 and earning $2,000 a month or less. However, all persons with disabilities qualify for the supplement. Some 366,000 people received it last year. The scheme is being reviewed, and the National Trades Union Congress has proposed that the Manpower Ministry consider applying the supplement to workers between the 20th and 30th income percentile. Another is the Progressive Wage Model (PWM), which sets a wage floor for certain sectors. Right now, it is mandatory for the following sectors: cleaning, security and landscaping. Talks are under way to expand the PWM to cover more sectors. The PWM has different wage floors for each sector - $1,120 for cleaning, $1,100 for security and $1,300 for landscaping. The model also specifies how much more these workers should be paid as they upgrade their skills. For example, a cleaner could start out with a salary of $1,120, but if he learns how to do outdoor cleaning or cleaning in healthcare establishments, he could earn at least $1,320. 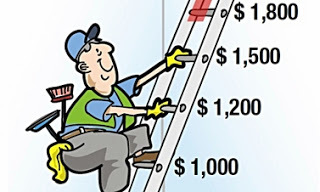 Cleaners who can operate machinery can earn even more, at least $1,520, and those who move further up the ladder to become supervisors can expect a pay of at least $1,720. Commenting on Prof Koh's Facebook post, Mr Lim said the thinking behind the PWM was "not to distort the labour market, not to impose a wage cost on employers that they did not consider viable". "It prevents the premature relocation of business out of Singapore to other countries with cheaper labour costs," he said. Wading into the debate yesterday, labour MP Zainal Sapari said that if Singapore keeps pushing wages up without productivity gains or improved service outcomes, there could be unintended consequences on workers. For example, he said, there have been cases where clients told their security agencies to replace older security officers because they did not think it was fair that they were paying more for the same person to do the same job. Speaking to the media at an event yesterday, labour chief Ng Chee Meng said the PWM is a better model than a universal minimum wage because it sets a path for more sustainable wage increases for workers, linked to productivity growth. "The (idea of a) minimum wage is well-intended, but there are downsides. If a worker does not meet the productivity needs of an employer, it means no wage - you will be out of a job," he said. "It could also mean, ironically, that the minimum wage becomes the maximum wage - the employer sees this as a reasonable payout to the employee, and there would be no wage increases." WHAT MORE CAN BE DONE FOR LOW-WAGE WORKERS? Whatever positions they take on the matter, those weighing in agree that more can be done for low-wage workers. Prof Koh, for one, does not think that existing schemes have done enough. He said on Facebook: "This morning, I went to a Shell station to buy petrol for my car. The attendant, Mr Tan, told me that he earns $1,000 a month. I do not regard that as a living wage." Generally speaking, a living wage is a level of income that would allow a worker to pay for basic necessities, small comforts and meet an acceptable standard of living. But these are all subjective standards, and there is no definitive measure of what a living wage in Singapore should be. As Mr Lim noted in his reply to Prof Koh on Facebook: "I do appreciate and respect your moral stand that each worker should earn a 'living wage', though we are likely to have very differing views on what a 'living wage' should be." Still, Mr Lim agreed that the Government has to review its social security provisions as the economy heads into a future that is being rapidly disrupted by technology. In his comments to the media yesterday, Mr Ng said he would like to see the PWM extended to other sectors. More workers should also receive training to accelerate their productivity growth, he added. "Because this, in essence, is how we keep our workers gainfully employed with a 'living wage', whichever way we want to define it." No Singaporean will disagree with Professor Tommy Koh's example that the $1,000 a month that a pump attendant earns is not a living wage here (What's the best way to lift pay of low-wage workers? Oct 30). But a minimum wage law will not, unfortunately, help. Singapore's petrol stations hire pump attendants because they are prepared to pay $1,000 per attendant to offer this extra service to motorists, and there happens to be takers at this rate. They can easily drop this extra, or reduce the number to one per station, if they are mandated to pay more. The reality is pump attendants are not essential to petrol stations. The solution for Prof Koh's attendant is to get a "real" job that is not just a discretionary add-on to his employer's operations, thereby commanding a better wage. If he does not have the skills to do so, then that is a larger problem that will not be solved by a minimum wage law. I have discovered that a good number of pump attendants work only part time during peak hours. I do not know how many hours they work a week. If they are paid $1,000 for less than full time work, then we may have to recast the idea of a living wage on an hourly basis, which is how minimum wages are set in countries that practise them. This may then change the picture. I also chat with cleaners in the flatted factory I work in from time to time. I was friendly with one uncle who said that he actually did not need to work because his flat had been paid for and his children were earning decent salaries. He worked, he said, to stay fit. I do not know whether there are more such low-wage Singaporeans who work out of choice, not necessity, and hence are not very particular about wages, especially on a less than full-time basis. "Low-wage Singaporeans" are thus a heterogeneous lot and broad statistics may not tell the full story. We must constantly review policies to ensure that they do not impede social mobility. My greatest admiration goes not to policy analysts, but field social workers who painstakingly work on individual cases of real poor Singaporean families to help them reorganise their lives, with the aim of achieving sustainable self-reliance with dignity.